Register for the 2017 MPMC Media Trade Conference, Tuesday–Thursday, January 24–26, 2017, at the Embassy Suites Orange County Airport North in Santa Ana, California. Hundreds of journalists from throughout the country have already signed up for the 2017 MPMC Media Trade Conference, to be held January 24–26, at the Embassy Suites Orange County North in Santa Ana, California. However, media who have not yet registered can still do so at www.sema.org/mpmcmediaregister. 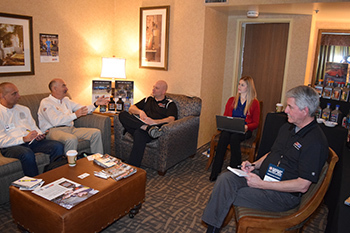 Personalized schedules will be sent by January 10, so register today to take advantage of what reporters describe as the year’s best opportunity to interview and connect with motorsports manufacturers. For questions regarding the event, contact Della Domingo at dellad@sema.org or Juan Torres at juant@sema.org.